That’s what we believe and that is the basis of our mission statement-providing the best quality, eco-friendly products and top services to each and every customer. 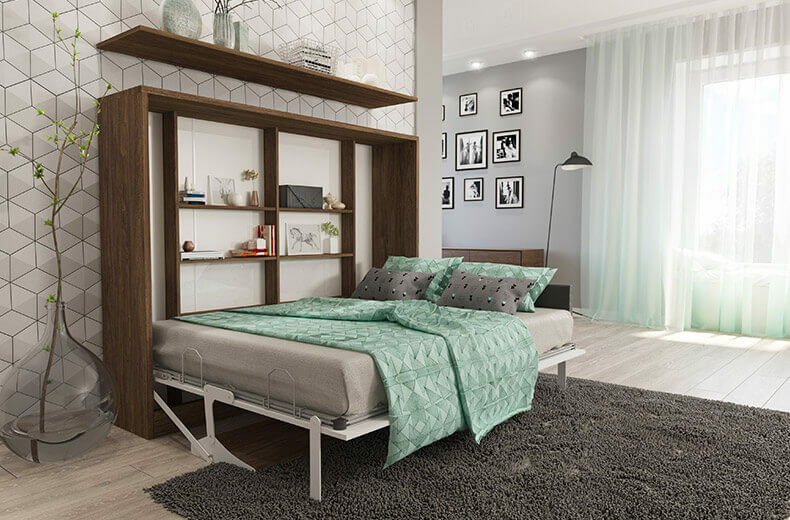 Multimo Company is based in Europe, and since the first day in business, they have been manufacturing innovative, ergonomic, space saving wall beds, sofa beds, and bunk beds. Today, their state of the art advanced technologyallows to deliver things like quadruple gas shock support system that makes opening and closing wall beds a simple one-handed operation. Multimo’s innovative products designs provides furniture with space saving storage options, and multifunctional use within a small area of floor space. Multimo furniture exceeds stringent EU standards, and their precision engineering, quality hardwood boards, durable finishes, and built-in safety features meet, or exceed, the highest levels of safety and quality certification standards. complete with online video assembly instructions. 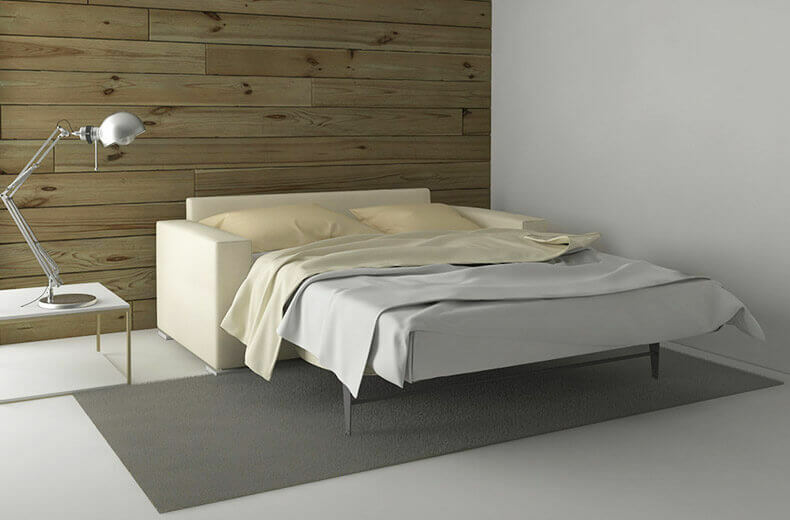 Multimo wall beds are available in 12 convertible styles. Many of these styles, when closed, take up minimal floor space of just under 1’6” x 7’.This is perfect for smaller bedrooms, home offices, condos, studio apartments, and mobile homes. With so many people downsizing their living space, finding ways to incorporate a quality bed and sleep space with built-in storage and bookshelves, tables, desks, and other multifunctional options is essential! We have wall beds ranging from twin to queen size that are the answer to all your space-saving requirements, as well as matching accessories like bookshelves and wardrobe cabinets to add even more space and storage options! include ergonomics features like gas shocks, hidden storage and thick memory foam mattresses that offer luxurious lifestyle comfort and are perfect for everyday use or for extra sleeping space for your guests. Multimo has been a frontrunner in implementing innovative changes in the sofa bed industry, and no longer will you or your guests have to endure feeling metal bed frame beneath your back while sleeping! 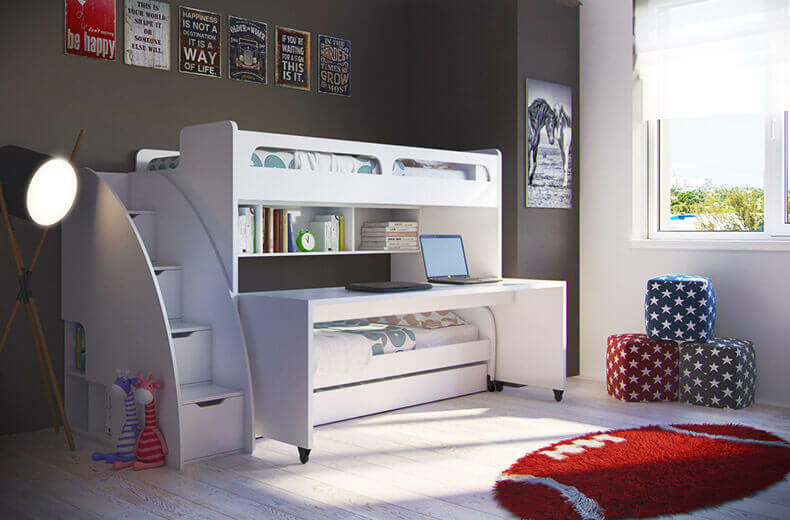 Multimo beds for children combine bunk beds with trundle or twin sofa, with shelves, desk, and everything a child needs to store toys, games, books, and clothing! When it comes to child safety and longevity in children’s furniture, we are committed to providing the very best. Features like sturdy stairs with built-in storage cubbies, built-in wardrobe, and durable melamine finishes that are scratch proof and easy to clean, make daily life and keeping a child organized and safe a whole lot easier! Check out our online videos and innovative new products, like the walking wall and Space Up kids bedroom, and you will be amazed by the beautiful ideas and possibilities you can create in your own home!